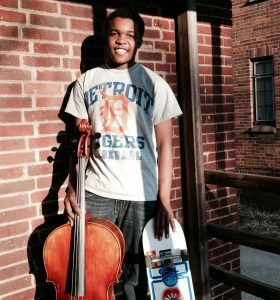 In May of 2014, the GRDC Community Blog featured a Grandmont Rosedale resident, Josh McClendon, a 14 year old up and coming cellist. Three and a half years ago is a long time when you’re a kid, and especially when you’ve got your eyes on a career in classical music. While you could say Josh no longer lives in Grandmont Rosedale because he lives and goes to school at Interlochen the pre-professional arts boarding school in Northern Michigan, his mother Voncile Campbell still calls Grandmont Rosedale home, and when Josh recently came home for the holidays, he came here, to Grandmont Rosedale. Just what Josh has been up to since May of 2014 is a pretty inspiring story. The article from 2014 says that Josh was getting ready to compete in the Sphinx Competition, a national string competition that gathers that most talented musicians in the country to compete before a panel of internationally renowned judges. The Sphinx Competition is for black and latino musicians from junior high through college age who hope to make their career in classical music. Musicians have to audition just to get the chance to compete. Josh knew the level of competition would be pretty high, so he decided not to compete that February in 2015. He didn’t compete the following year either. When asked by his teachers if he was going to compete, according to Josh, he’d “just “respond with an awkward smile and shrug.” Fear of not making it to the competition had taken hold. This past year at Interlochen, one of Josh’s teachers, Crispin Campbell, was having none of it: “You must compete in the Sphinx Competition,” he told Josh. Campbell wasn’t worried so much about Josh making it to the competition as he was concerned that Josh’s fear was preventing him from competing at all. So Josh sent an audition tape. Several week later Josh had just finished playing at a dinner for the James Tatum Foundation back in Detroit when, as he says “I did what all 17 year olds do: I checked my phone.” Josh saw the word “Congratulations!” at the beginning of an email from the Sphinx Organization, and well, the rest is kind of a blur. Josh had been coming to the Sphinx Competition to watch the musicians perform since he was eight, and last February he was on that stage at Orchestra Hall, playing cello in the Sphinx Competition. After the semi-final round, all the semi-finalists line the stage to hear the judges read off the names of the three finalists. “Josh McClendon!” was announced, and what Josh remembers most is his mother’s tears. In the final round, Josh played the third movement of Edouard Lalo’s Cello Concerto with the Sphinx Symphony Orchestra. Josh placed third and was invited to the Aspen Music Festival, a classical music festival founded in 1949. Sphinx granted Josh a scholarship to attend, and once his performance was over, Josh was invited to stay the summer in Aspen, performing and training with musicians from over 40 countries. This is Josh’s senior year and he’s pretty busy applying to colleges and auditioning. He plans on competing at the Sphinx Competition next year, in the senior division. He doesn’t hesitate about it this time: “Never again will I let myself fall victim to self-selection.” Bravo, Josh. It’s hard to say which is more impressive, your musicianship or your ability to conquer self-doubt. See you at the symphony! Below is a link to a video of Josh performing Elgar’s Cello Concerto in E Minor, Op. 85 with the Detroit Symphony Youth Orchestra, followed by the article that ran in May of 2014. At eight, Josh heard the cello for the first time. “I loved the sound of it – the deep tone, the perfect register. It has so much range and variety.” When he took up the cello, Josh immediately started memorizing music, sometimes long pieces of music. “The music is like seeing a person or a story I’ve seen before. I remember.” Since then Josh has performed with several organizations such as the Urban Strings Summer Camp and the Civic Youth Ensemble of the Detroit Symphony Orchestra. This summer will be his sixth summer at Interlochen Arts Camp to which he won a scholarship. Last summer Josh was principal cellist. Clearly they see something unusual in Josh as well. Josh has not reached this level without support, of course. Voncile has driven him to countless lessons and competitions, most recently so that Josh can take lessons from Paul Wingert, a 38 year member of the DSO. Josh’s Uncle Jeron is another cheerleader, making sure Josh has always had an instrument: “Whatever you can do to support a gift, you do it.” Josh has also won the James Tatum Foundation for the Arts Scholarship, the Al McKenzie Scholarship (twice), the Omega Psi Phi Scholarship and, most recently, the Slotkin Music Scholarship at Cranbrook. Josh is a bit nervous, but hopeful about competing in next year’s Sphinx Competition. His mother and uncle, however, are convinced: “Of course you’ll be ready,” Voncile says. While Josh does spend a great deal of time making beautiful music, he also skateboards and plays lacrosse. He does both because they’re fun, but he’s careful not to hurt his hands. Josh also understands that he’s part of a community. You may have heard him play at the Holiday Breakfast at the Community House the last couple of years. Catch him while you can, though. He has his sights on Julliard or maybe the Curtis Institute of Music. His dream, after all, is to be a world-touring solo cellist. Not a bad ambition for a 14 year old from North Rosedale Park.